It's intimidating to write a literary critique for Ed McBain's kickstarter “Cop Hater”. Written by Evan Hunter, it's the mantle piece for the police procedural book and the debut of the highly respectable '87th Precinct' series. According to the author, it was written in 1955 after spending a lengthy amount of time within the NYPD researching and planning. In the Thomas & Mercer re-print, Hunter's introduction provides an intimate peek at the book's development (which you can read for free as an Amazon download sample) and the conception of the pseudonym McBain. While the police procedural could probably be linked to a handful of novels a decade before, the '87th Precinct' series was probably only rivaled by the show that influenced it – Dragnet. While detective Steve Carella is featured as a main character, the series is one of the first (if not first) to feature a conglomerate hero, the squad of cops that make up the fictional 87th Precinct. The squad is a character just as much as the unnamed fictional city is. Hunter, while struggling with placing the series in New York City, found it much easier to fictionalize the city while using NYC as a primary blueprint. While not ruining it for the new reader, the concept of “Cop Hater” is essentially that – a madman targeting police officers of the 87th Precinct. Like a good Agatha Christie whodunit, the mystery enlarges as the corpses stack up. While never explicit or terribly violent (or I'm just numb), we familiarize ourselves with these officers only to find them shockingly killed off before our very eyes. We're at the scene of the crime, but never know the killer's identity until the end. It's not a first-person narration like a majority of detective fiction, instead it's the author leading us through the alleys, buildings and squad rooms of this sweltering city. Detective Steve Carella is firmly embedded in the action, introduced here along with his fiance, the lovable Theodora Franklin. The muggy July heat plays havoc on these characters, eroding patience, love and goodwill with a toxic, febrile blanket of exhaustion. Hunter would steadfastly utilize weather as a character itself, inserting climatic changes to these stories to enrich and enhance the atmosphere. At times the dialogue is as simple as the police interviews – Who, Where, What and the allusive Why. It's our struggle every bit as much as the cops. By the closing pages it's all a frantic chase for the pre-smoking barrel, stopping the .45 slug from finding the next blue shirt. 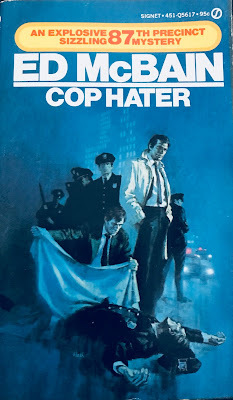 “Cop Hater” is masterfully penned, properly paced and is worthy of the praise heaped on it for half a century.